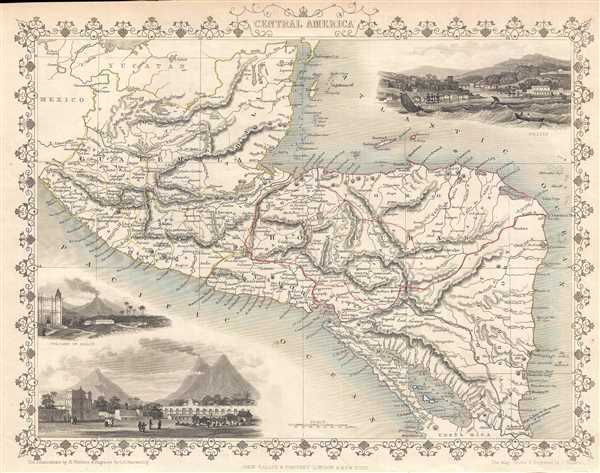 Intricately engraved map of Central America featuring three incredible vignettes. This is a highly decorative 1851 map of Central America by John Tallis and John Rapkin. The map depicts from southern Mexico and the Yucatan peninsula south to extreme northern Costa Rica. Mexico, Belize (Belise), Guatemala, Honduras, El Salvador (Salvador), Nicaragua, and Costa Rica are labeled, as well as both the Pacific and Atlantic Oceans and numerous islands along the Atlantic coast. Lake Nicaragua, the largest lake in Central America, is depicted. Three beautiful vignettes are included. Two of the vignettes, located in the lower left corner, depict the volcano of Izalco (Isalco), which is in El Salvador and the Great Square of the Antigua in Guatemala. The vignette in the upper right corner presents a scene from Belize (Belise). The vignette illustrates a scene in a bay, troubled by rough seas. Several boats, including a row boat with two people in it, and four sail boats, are in the bay making their way toward the safety of the harbor. Two large sailing ships are already moored along the coastline, which is very lush and several buildings are depicted. The map is surrounded by a vine motif border. The map was engraved by John Rapkin and the illustrations were drawn by Henry Winkles and engraved by G.R. Manwaring for John Tallis's 1851 Illustrated Atlas.